Our staff take responsibility for the learning and progress of all children and know who our E6 and vulnerable pupils are. There are no excuses for underperformance and the language of ‘learning’ is used right across school and, through meta-cognitive strategies such as ‘Building Learning Power’, children are taught to be learners from when they enter in the Nursery. The continual development of ‘Quality First Teaching’, Feedback for Learning’ and the inclusion of meta-cognitive strategies in lessons have ensured that teaching and learning continues to improve. The school has divided classes up into key ‘phases’ in order to aid transition for vulnerable pupils and each phase is led by a member of SLT. We continually evaluate, through rigorous data tracking, the effectiveness of the interventions we offer. We train our LSAs and teachers to deliver the highest quality interventions that reap the greatest benefits for our children in terms of maximising their progress. We invest heavily in staff development to ensure that all children including E6 are being taught by skilled professionals. LSA Timetables are fluid, based on need, and interventions are evaluated every half term so that alterations can be made. All staff are held accountable for the progress of the pupils they have taught. We have increased our capacity for early intervention by providing a greater number of interventions in the EYFS and skilling staff in this phase of school. Improvements to continual provision for the Early Learners phase and the outdoor environment, the further development of Forest School, use of specialist teachers to deliver the arts and sport, enhancement of home learning opportunities and the subsidisation of trips and visits all count towards the increased engagement of our E6 pupils. 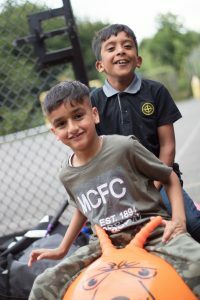 As it is not always the case that E6 pupils are the lowest attaining, we have put in place a range of tailored interventions and opportunities to provide stretch and challenge for those more able E6 children. These opportunities include a higher order maths group, delivered by a Maths Specialist teacher, a blogging club for those identified more able in Literacy, and a critical thinkers group. Through the development of ‘Feedback for Learning’, the facilitation of Structured Conversations to the parents of all E6 children, the delivery of the REAL project, and the provision of parental engagement classes such as Readiness for School and Adult Literacy we have been able to begin to raise the aspirations of many of our parents.